This Pork Pie recipe really transformed and grew into its own during the Victorian period: of course there had been versions of Pork Pies around for hundreds of years, the first recipes for Pork Pies appeared as early as the 14th Century, (seasoned with nutmeg, mace and raisins, while the pie crust was topped up inside with melted butter instead of a pork jelly) but this hand-raised, hot-water crust recipe from the 1800s is considered to be the best (and also now the most traditional) of all the versions of a commercial Pork Pie. Note On The Pork Pie Jelly: The addition of the traditional jelly after baking the pie fills the airspace created when the baked meat contracts on cooling, the jelly helps preserve the pie and helps keep it moist. A properly made jelly from a traditional Melton Mowbray pork stock (see this Pork Stock & Jelly Recipe) also adds the ‘secret-sauce’ to this seemingly very simple pie filling. Added in warm (and still liquid) the stock flows over (covering and coating) the cooked meat in the baked pie, before setting into a subtle tasting clear jelly; and together, this is what makes this pie world-famous. A Pork Pie rewards patience … in our opinion it is best to make a Pork Pie one day, cover and leave it in the fridge over night, then bake it in the oven the next day, add the warm stock for the jelly, leave once more covered in the fridge, and then eat it the day after. Although this does not have to be rigidly stuck to if you want to make it quicker. 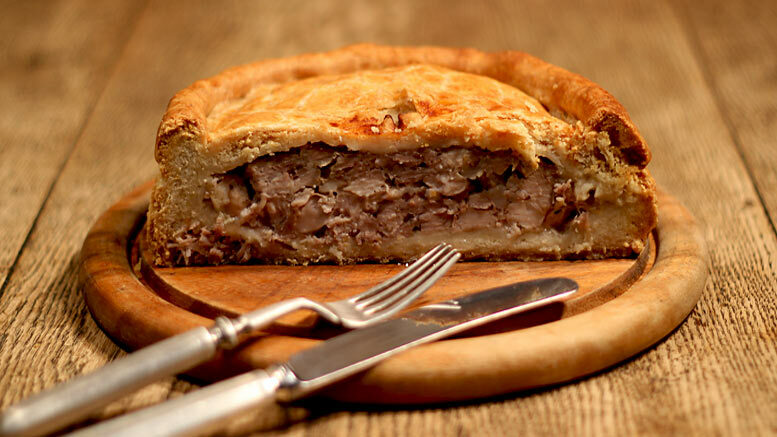 Note on flour: some commercial makes of Melton Mowbray Pork Pies use wholemeal (wholewheat) flour which gives the pie pastry an almost rustic bread look and feel; although these are in the minority, you can choose to use plain flour or wholemeal. In a mixing bowl sieve the flour, make a well in the centre, add the sea salt. In a saucepan gently heat the lard in the water until it has melted, then bring rapidly to the boil. Pour immediately into the well in the flour and draw the ingredients together with a wooden spoon to form a soft, pliable ball of dough. Leave to cool about an hour, but during this time knead once or twice. This pastry must be used whilst still room temperature, otherwise it will become brittle and hard to mould, although there is a balance, the cooler it gets the easier it is to mould. Using a very sharp knife cut up the shoulder of pork, and any fat surrounding it, into very small pieces. In a mixing bowl mix together the chopped pork, sea salt and black pepper. Moisten with 2 tablespoons of water. Use your hands to make sure everything is fully mixed together. Hand raising the pastry: to make an authentic British Pork Pie a hand-raising technique, going back over at least 700 years, for the pastry is used. Knead the pastry so that it is still warm but firming up. Roll it into a ball and break off one-third to use as a pie lid. Take the larger piece and roll it back into a ball. Then on a floured work surface press the ball of dough out flatter into a round thick disc with the palm of your hand. Start to pinch the edges of the disc between fingers and thumbs and working your way around the disc start to raise up the sides. At the same time press your fingers into the base to flatten it out and to enlarge it. The more you work it, the more the pastry cools and firms up, and the easier this becomes. If you put your fist inside the pastry case as a support you can use the palm of your other hand on the outside to work the sides of the case up higher and thinner around it. You need to create a round pie base which is about 15 cm across with walls about 8 cm high. If the walls become a little thin in places gather together a section and fold it into itself and rework. This case will take about 5 to 10 minutes of working, it is not a ‘quick’ thing, but it is satisfying. Make sure the pastry walls are thick enough to withstand being baked unsupported. Take the Melton Mowbray pork pie filling, make it into a ball, and pack the meat mixture into the pastry base, coming just under the top. 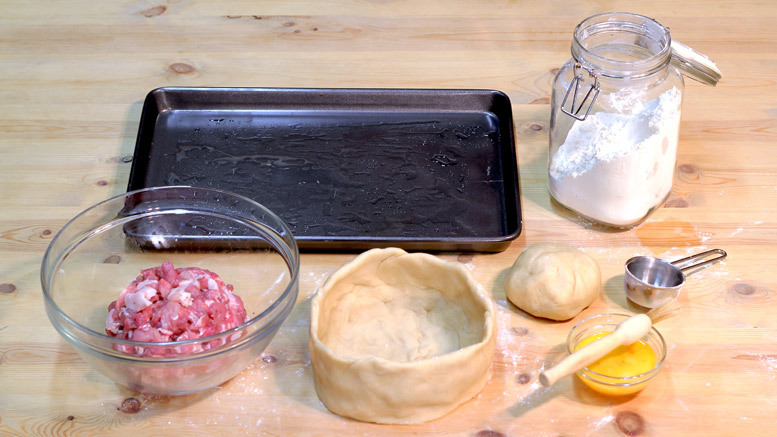 Take the remaining pastry to make a lid for the pie. Using the palm of your hand flatten it out on the floured work surface into a disc big enough to fit as a pie lid. Place the lid over the meat filling and press the edges together tightly to seal. When the meat is in and the pie lid is sealed the pie takes on a far more rigid integrity, which is much easier to work and shape. Cut a small hole in the centre of the pastry lid for steam. Brush the top of the pastry with beaten egg. Place on a baking tray. The pie can be baked now, or the next day, if baking the next day cover and put in the fridge. Put the pie in the pre-heated oven and bake for 10 minutes at 200C then reduce the temperature to 160C and bake for a further 2 hours. As it bakes the pie will sink a little and ‘bow’ out which is the sign of a true hand-made Melton Mowbray Pork Pie, a pie which is not baked supported in any hoops or pie moulds. After 2 hours remove the pie from the oven, brush the sides and top with some more beaten egg, and return to the oven for 10 minutes, until it goes a deep golden brown. Remove from the oven, leave until almost cold. Then fill with the jelly to seal, use a funnel to help pour in the warm stock through the steam vent in the pie crust. Depending on how many, and how big, the gaps are under the pie lid you will need more or less of the warm pork stock to set into a clear jelly – probably no more than 100ml; about 100ml is usual in a well made pie. Once poured in put the pie in the fridge, let it settle for 20 minutes, then pour in a little more stock for a second time if it needs it. Cover the pie and leave it in the fridge for several hours (overnight is recommended) for the jelly to set and the pie to firm up. To make the traditional jelly (or aspic) to go in the Melton Mowbray Pork Pie see this Pork Stock & Jelly Recipe.